Caffrey was passed out in the vineyard in corpse pose, his feet inches from a pile of manure. My aunt was post-booze snoozing in the back seat of our rental car while my mom and I strolled through a field, walking off the calories and elevated BAC from our hearty five course lunch and all-you-can-drink wine pairing feast. Laughter and high spirits from La Azul bodega’s patio drifted across the roadway and through the trellised vines. 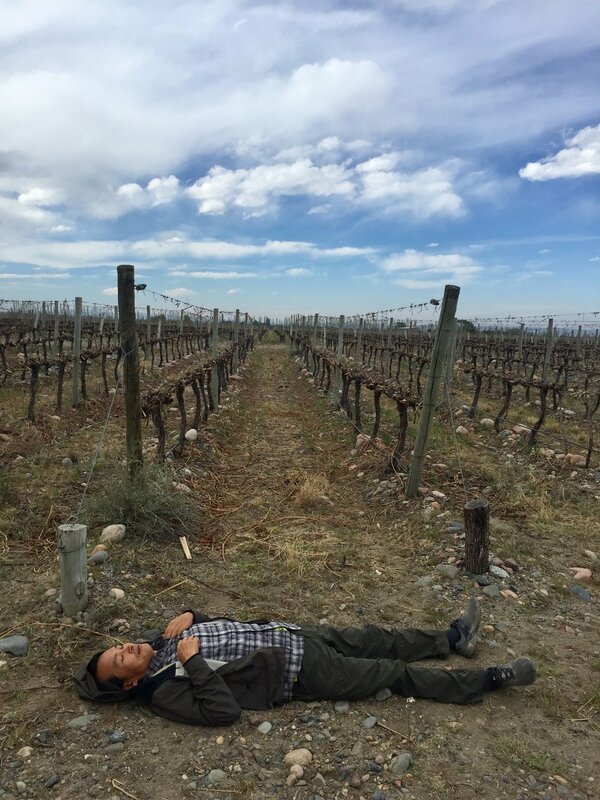 This was day three of our excursions into Mendoza’s wine regions and we were satiated. Nearly 400,000 acres of vineyard are nestled in the semi-arid shadows of the Andes mountain range in western Argentina, ancestors of French, Italian and Spanish sprigs planted by European settlers in the 19th century. Malbec grapes are the most prevalent, but Cabernet Sauvignon, Tempranillo, and Chardonnay also grow well in this high altitude region. Argentina is the world’s fifth largest producer of wine. After traveling throughout Asia for months, I was thirsting for some truly terrific, affordable wine. We visited Mendoza in September, just after planting was completed. Temperatures were beginning to warm but snow still blanketed the mountain peaks. Enthusiastic tender green shoots soaked up the early season sunshine. There are hundreds of bodegas scattered across three distinct growing regions in Mendoza Province: Maipú, Lujan de Cuyo, and Uco Valley. Knowing which wineries to visit can be a daunting task, especially in the off-season when many are closed to tourists or operating with limited hours. This is not a post about the “10 Best” vineyards in Mendoza, as I have no authority to write as if I could draw such a conclusion. We were interested in quality of experience, rather than quantity of wine sampled. We spent three days enjoying three unique experiences in Argentina’s wine regions and I recommend every place mentioned in this post (Bodega Domiciano, Viña el Cerno, Carmello Patti, Cava de Cano, La Azul, and Mr. Hugo’s Bike Rental). When planning your excursion, my advice is to not overthink it. Pick a few bodegas, make some calls, and then head out! Or hire a driver and let him or her decide. The wine and food will be excellent wherever you go. Just relax and have fun. The Maipú region is closest to Mendoza City, about a 30 minute drive by car or bus. We pulled into Mr. Hugo’s Bike Rental about 2:00 p.m. and were greeted with a warm smile by Mr. Hugo (a.k.a. “nicest man on earth”; his eyes actually sparkle like Santa’s). He hooked us up with four bicycles and then helped us plot a route. The Maipú region is a good place to start your Mendoza wine tour. Think of it as a warm-up. The wineries are stretched along a busy industrial corridor; it’s not very scenic, but there is a bike lane along the highway. Once inside the gated vineyards, the noise subsides and the farmlands are beautiful. Most of the tasting rooms in the Maipú region were not yet open for the tourist season. The few that were accepting visitors closed at 5:00 or 6:00 p.m., so we did not have much time. Based on Mr. Hugo’s suggestions, we began our tasting at Bodega Domiciano. We did not have a reservation, but a friendly, English-speaking woman accommodated us without hesitation. She led us through the small vineyard, explaining that Bodega Domiciano is a family-run operation known for harvesting its grapes at night to preserve quality (hence the stars in their logo). We got a peek inside the fermentation room and then went down below to the barrel storage area. Our guide was knowledgeable and passionate, accommodating our requests for various wines outside of their normal tasting menu. 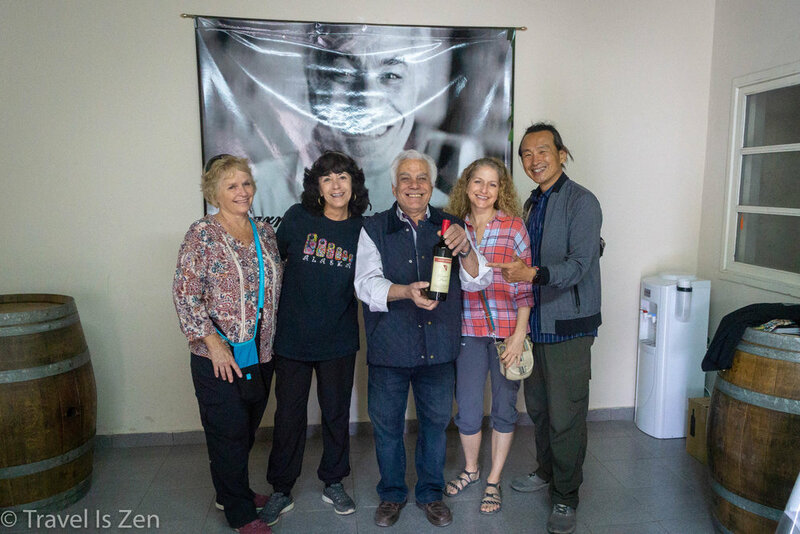 Tour and tasting price for four people at Domiciano Bodega: USD$16.00 total in Sept 2018. We peddled 10 kilometers down busy Urquiza Avenue, sun high and no headwind. We turned left onto a dusty tree lined lane, spun our wheels another kilo, and arrived at Viña el Cerno Winery 20 minutes before their closing time. The owner’s daughter graciously accommodated our tasting request, again with no advance reservation. Viña el Cerno is a boutique organic winery producing 60,000 bottles annually. The wines are sold only at their vineyard. My mom and Aunt were concerned about bicycling back to Mr. Hugo’s, so they only drank sparkling water. Caffrey and I enjoyed very generous tasting portions of white, red, rose and sparkling varietals, downing them before the vineyard closed for the day. Tasting price for two people at Viña el Cerno: USD$6.00 total in Sept 2018. The next day, we drove a little further from our home base in Mendoza City to the upscale town of Luján de Cuyo along the Mendoza River. Every blog or online article about the Mendoza wine region mentions Carmello Patti. Following a regional map, we walked into an unassuming garage bodega, doubting we were in the right place. Sure enough, though, we were welcomed by the renowned Mr. Patti. Mr. Patti speaks very little English, so we were lucky that another couple had hired an English-speaking translator who generously interpreted for all of us Mr. Patti’s explanation of each wine and the history of his vineyard. Then he shared a tasting of a few of his picks, all free of charge. Lecture and tasting price for four people at Carmello Patti: USD$0.00 (free!) total in Sept 2018. We did not linger long at Carmello Patti because we had lunch reservations next door at Cava de Cano. 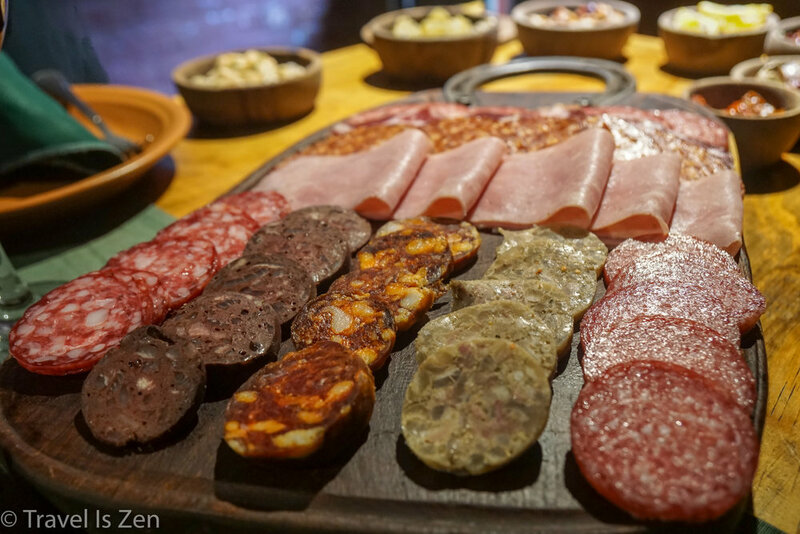 We had not intended to spend the entire afternoon stuffing our faces with delicious meats, cheeses, stews, empanadas, desserts and bottomless wine, but when in Argentina, go with the indulgence! When we arrived, we were ushered to our own private dining room where a traditional Argentinian picada (picnic) was already laid out. Spanish opera music was set to the perfect volume for conversation; the ambiance was muy bien! Pair that with four bottles of wine — two reds, a white and a rose — and we were set for the rest of the day. 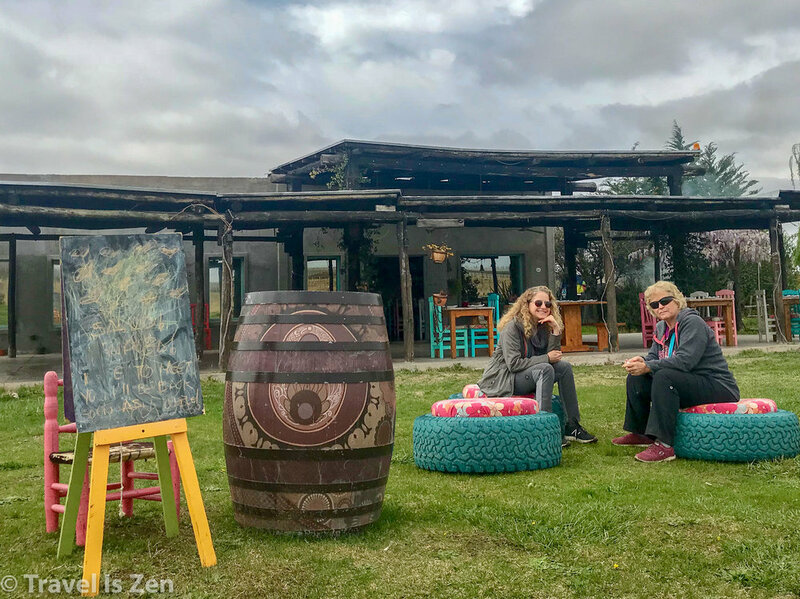 We had reservations for an afternoon wine tasting at another vineyard, but we were so comfortable and cozy at Cava de Cano that we stayed for four hours, talking, laughing and enjoying the authentic tastes of Argentina. Lunch and wine pairing for four people at Cava de Cano: USD$61.00 in Sept 2018. I’m not sure if we were even fully digested from the prior day’s feast when we arrived at La Azul bodega in Uco Valley, a layer of fog slowly dissipating from the tops of the Andes. Uco Valley is iconic “wine country”, with miles of vineyards separated by linear groves of trees, snow-capped mountains in the distance, and stylish architecture. 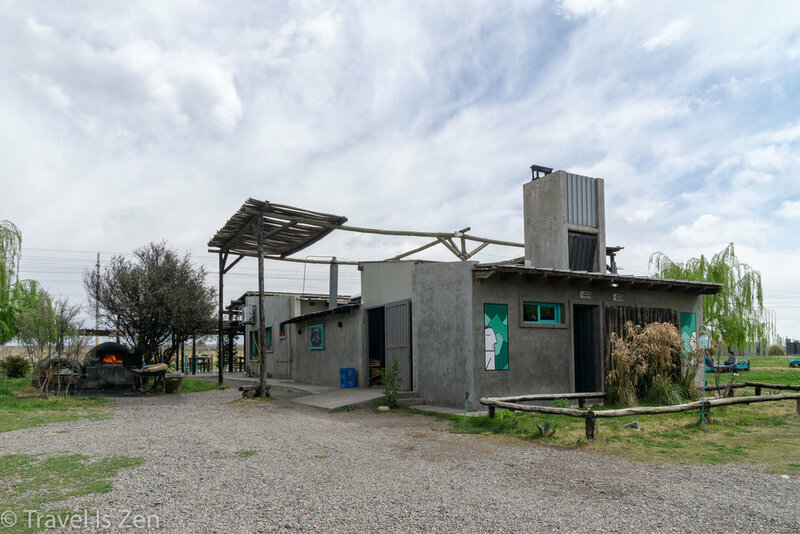 Yet, it maintains the laid-back, relaxed feel we enjoyed in Maipú and Luján de Cuyo. No pretentiousness in Argentina’s wine country. It was still early in the morning and we were lucky to get a last-minute tasting and lunch reservation at one of the few wineries open in Uco Valley in the early Spring. The weather was warm, so we sat outside in a cushy, cozy lounging area. This bodega is designed to be an all-day affair. That’s the thing about Mendoza’s wine region - it’s not a place to rush to and fro, gulping down little inches of wine samples and scampering through vintner cellars. Touring Argentina’s wine country is about slowing down (quality over quantity). Enjoy the ones you’re with and savor the moment. Don’t try to rush! We started with another very generous wine tasting. I can’t be certain, but I’m pretty sure our sommelier was already half-crocked before noon and determined to have drunk-buddies. She provided an expert’s explanation of each wine and then ensured the quality of each bottle by imbibing half a glass herself before serving our tasting. You know, just to ensure the quality (wink wink). The highlight of this tasting was sampling a Gran Reserva from the vat, raw and unrefined — a walk on the wild side. Then we feasted (again!) at La Azul’s criollo restó, serving Argentina’s ancestral food. The day’s asado options included pork, beef, and chicken, as well as a vegetarian ravioli option. We each chose a separate main dish and dessert so that we could share. The other three courses were fixed (a crepe, choripan, and empanada). Most memorable was the chorizo on a sweet bun, which was the best choripan we had in Argentina. We arrived at La Azul around 11:00 a.m. and didn’t leave until near 5:00 p.m. Tasting, dining, lounging, strolling through the vineyards…can’t think of a better way to spend an entire day in Mendoza’s Uco Valley. 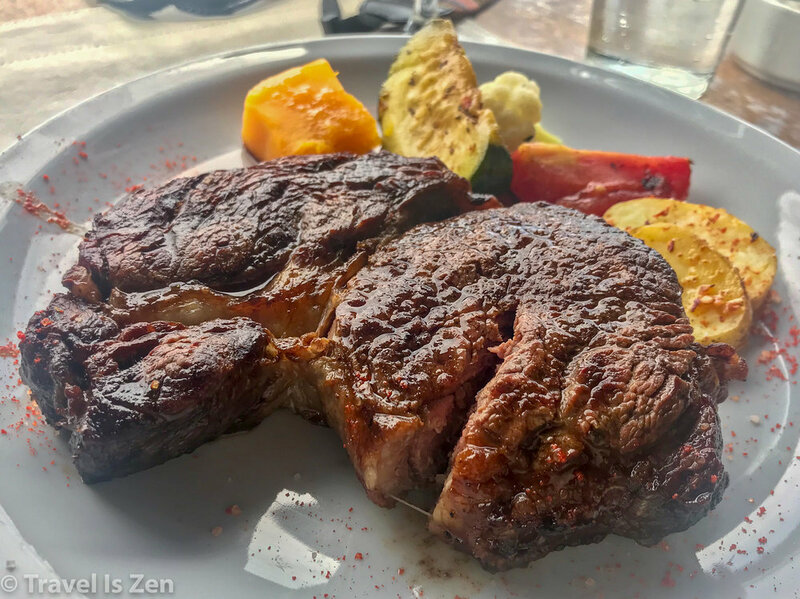 Tasting, tour, five course lunch and unlimited wine for four people at La Azul Restó: USD$158.00 in Sept 2018. Have you been to Mendoza Province? What were the prices like when you visited? Napa Valley is on our bucket list, but I think I’ll get sticker shock after visiting Argentina’s wine region. Comment to share your experience or tag @travel.is.zen on instagram with your photos. Happy travels!